Unscrambling the AFUE Mess: Which Boilers Waste Energy? Those little yellow AFUE rating labels stuck on new boilers lead to inaccurate claims. Most conventional boilers claim to be high efficiency because their AFUE (government) efficiency ratings, shown on yellow labels, are based on only limited testing. There are many factors that are not taken into consideration during these tests of "efficiency." Have you ever seen a technician test a piece of heating equipment during a combustion efficiency test? First we clean the boiler, then we reassemble the boiler or furnace. The piece of equipment is ice cold or room temperature. Then we start the system and wait, and wait, and wait. What are we waiting for? Well, we are waiting for the perfect moment in time to perform the efficiency test. We are waiting for the flame to become stabilized, we are waiting for the piece of equipment to come up to "full temperature" before we test it. You may be asking yourself why we would do that. Well, the answer is that if the test were performed on a cold piece of equipment we would not get that touted "your boiler/furnace is 84% efficient, Mrs. Jones." Heat the water quick, get the water into the system quick, cool the boiler down after the heating cycle is complete. Outdoor reset controls do not cure the flaws in heating equipment design. Adjusting the water temperature to outdoor temperature is good, but it does not solve energy loss problems associated with high mass systems. The most efficient way to heat is to have low mass design. A low mass design with a purge control provides the equipment with the ability to cool down once the heating cycle is complete. This control removes all the heat that would normally be lost up the chimney. The control is temperature/time activated to bring the boiler jacket back to, or close to, room temperature when the heating cycle is complete. Purchasing a new piece of heating equipment can be a nightmare for home and business owners. How many time in their lives have they purchased new heating or cooling equipment? Some have bought one, maybe two in the course of their lives. When gathering estimates for replacement, the only thing that they have to go on are these little yellow stickers. All the contractors point to these stickers and declare "My boiler is 85% efficient," "My boiler is "87% efficient." Please don’t be misled by the sticker sale. We know that these numbers are skewed to provide the highest numbers based on testing that is flawed. Do you plan to heat water with this piece of equipment? Then throw the little yellow sticker out. That piece of equipment has not been measured as a hot water maker. Knowing now that a new piece of heating equipment may or may not give you the savings you deserve, what do you do? Contact a licensed heating professional who can help you unscramble all the points that need to be touched. Don’t rely on just AFUE when buying a new piece of equipment. Count on case studies, such as the one below. Ask your contractor for more information than just, "this works well." 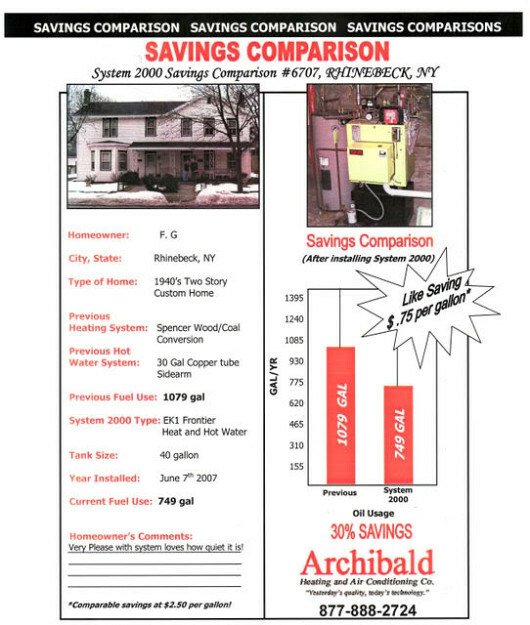 Contributed by DeWitt J. Archibald, President and Chief System Designer Geothermal/Commercial Division at Archibald Heating and Air Conditioning, RSES-IBR-NATE-Lic#307.